We are consumers based on innovation and research. We are always digging through the internet on a mission to find the NEW. We look to the scientist for a new discovery. Have you been drinking your 100% whey protein shake after a brutal workout, thinking you are really ahead of the curve...convinced it's the holy grail of protein? I wish I could sit here and tell you that a whey + casein protein shake is NEW cutting edge science that PEScience discovered. It's not. It was discovered by numerous renouned scientists in over a dozen human trials. It's time to take the blinders off. In our quest to build muscle, protein intake is the single most important factor. When I say intake, I don't just mean amount...I mean the type of protein too. Reputable journals have already tested the effects of different proteins in human subjects, and the data could not be more conclusive. Whey + Casein is the superior choice. The media tells me that whey builds muscle. And you know what? They're totally right. Studies do show that whey alone builds muscle better than other proteins. But if you look what they compare it to, the issue is clear: studies compare whey to weak products like soy-based protein, sugary drinks, and even just water. Of course whey is going to come out on top! It wasn't until recently that scientists finally decided to give all these 100% whey products a run for their money. And the results were shocking. Nature had it right. When researchers at the world-renowned Mayo Clinic tested a combination of whey + casein protein, as found naturally in milk protein, they discovered that the two protein sources work together to build lean muscle. 100% whey protein in isolation only gets you so far... it can spike protein synthesis with an influx of amino acids, but quickly returns to baseline, leaving you where you started. Enter casein, a slower-digesting protein that's typically consumed for its anti-catabolic properties as it promotes a steady release of amino acids over time. Casein actually results in more retention of ingested protein than whey! In another published study, researchers found the combination of whey protein with casein protein resulted in a quick increase in protein synthesisalong with a sustained elevation in plasma leucine levels. Plasma leucine levels are a key dictator of muscle protein synthesis, and thus, a combination of whey protein and casein protein may serve to maximize muscle protein accumulation. Whey protein hits the bloodstream at a fast rate, but it is casein protein that has been shown to create the strongest leucine balance. It only makes sense to consume them together. Studies have repeatedly shown that milk may be the optimal post workout drink due to the unique delivery and interplay of milk protein's components: whey protein and casein protein, together. In fact, the research shows that even if amino acid content of a protein is held constant, milk protein augments lean muscle accrual to a greater degree than fast-digesting hydrolyzed proteins due to the unique pattern of amino acid delivery that only milk protein can provide. Nature had it right all along: milk protein is king. 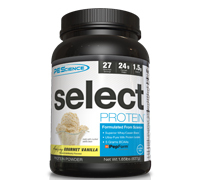 Did I mention that Milk Protein Isolate is the first ingredient in our SELECT Protein? We already know that whey protein spikes muscle protein synthesis while casein protein creates an anti-catabolic trickle of amino acids, a complementary combination that should be taken at the same time. But in addition to this, whey protein and casein protein each have their own unique bioactive subfractions and growth factors which work in concert when they're taken together. This is why I was so pissed when I saw the new research... we've been shortchanging ourselves for years. I don't just want something better than whey... I want the best. The 2005 International Whey Conference concluded that a mixture of whey + casein is the optimal form of protein for gaining muscle mass. That's right, even at a whey conference, the researchers found that 100% whey is not the answer! So if a synergistic whey-casein protein blend is the optimal blend for building muscle, what do you think SELECT Protein brings you? That's right: A whey-casein blend! Milk protein is 80% casein and 20% whey, and is our favorite source of casein and the #1 ingredient of SELECT Protein. "[R]esearch seems to suggest that consuming slower digesting proteins, or a mixture of fast and slow proteins during the post-training period may provide superior results compared to a fast protein... [M]ilk protein isolate (MPI), which contains 20% whey and 80% casein might turn out to be an ideal post-workout protein[...] By providing a rapidly available source of amino acids (from the whey) with a slower digesting source (from the casein), both protein synthesis and breakdown should be positively affected"
Since we know the research says that a blend of whey protein and casein protein is optimal, we found the best source of whey protein to add to our Milk Protein Isolate to bring the ratio of whey and casein to perfection. Whey Protein Concentrate (WPC) can be composed of anywhere from 34-80% protein. We elected to go with the highest quality possible, WPC-80 for short. This not only gives you the most high-grade protein for your buck, but unlike whey protein isolate, WPC-80 actually contains intact growth factors, allowing you to maximize lean muscle growth. You're short-changing yourself by using any other source of whey protein, period. Ingredients: Select Protein Blend (Milk Protein Isolate [comprised of casein protein and whey protein], Whey Protein Concentrate 80%, Leucine Peptides), Natural And Artificial Flavors, Salt, Guar Gum, Sucralose, Acesulfame Potassium. Vegetarian, Peanut Free, Lactose Free, Gluten Free, Aspartame Free, Non GMO, No MSG. Recommended Use: Mix or shake 35g (1 scoop) of Perfect Whey in 125 ml of your favourite beverage. Adjust amount of liquid to suit taste. Take 1 to 3 times daily or as recommended by a healthcare practitioner.